Part of what the iPad shows us very early on was that it’s all about the visual sweep. The device gave us the chance to rethink how information was being presented. A few early adopters changed everything by taking a whole new look at the physical world and didn’t just reproduce actions we did with pen and paper. News is an important area, which has had the most (in our opinion) different User Interface attempts to find what feels right for iPad users. An app like Read It Later brought us a whole new ability with it’s automated method to grab a whole Web page we viewed on our desktop computers and hold it to read later on the iPad or iPhone. The app has always been a tool to turn to as it presents the list of pages we needed to read in a clean list which we could then tap and read the page in a more ‘clean’ view. 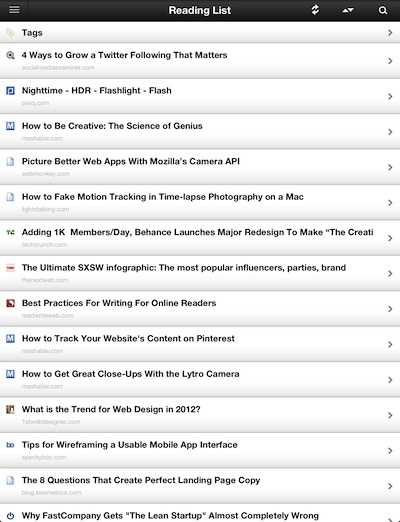 The list view of the articles we chose to read later has changed. 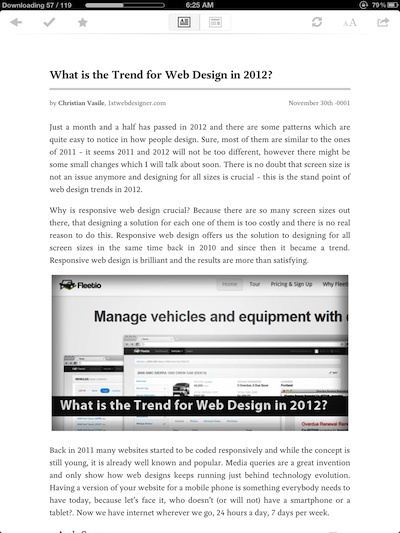 A much more graphical interface that has headed the direction of Flipboard where we see a graphic from the article as a teaser or reminder of the content. This make sweeping through a lot of articles a more visual than technology process. We won’t be looking for a keyword in a long list but rather that image we remember. Tapping a article still takes us to a cleaned up, ad free, view of the content. Images on the page can be viewed full screen by turning the iPad to landscape view. Sharing articles with friends on the popular social networks is still supported also. 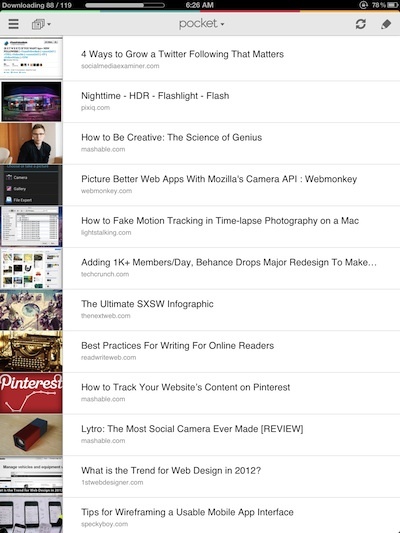 A grouping pull down has been added so you can view content limited down by Articles, Images, Video and all. Just another touch to enhance the usability available through having our information accessed through a touch screen. Don’t worry about loosing your list view of the content, it is still available, now with the images added as a line end thumbnail. 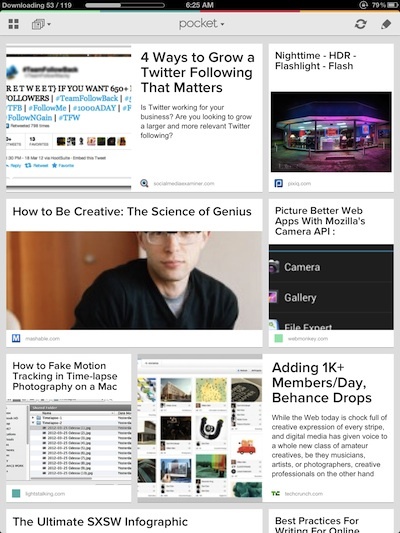 Favorites are still supported, with the chosen articles getting a yellow flagged corner instead of a start. They stand out nicely in either article overviews. If you save a lot of articles to read later, you can now do a bulk change to move articles into different groups simply by tapping the pencil icon in the upper right corner. All of the new fun coming to Read It Later, including a new name: Pocket. 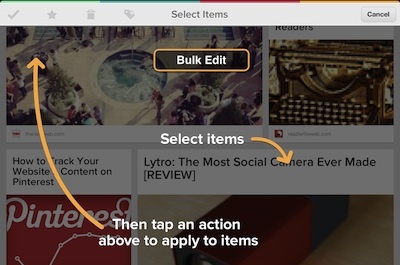 We assume the app is a stepping stone to more ‘take it with you’ features with a name change like Pocket. Looking forward to seeing what the developers have planned.